Well, through the science of human persistence, and the art of extreme sport, there is such a way to do all of those super human things! It's called Parkour, a mix of martial arts and gymnastics, designed to allow a person to move fluidly through rural structures. Defined as the art of "finding your own way", a freerunner can get from one point to another without ever stopping, no matter what obstacles are in the way. And, of course, there is! Check out this video to see some amazing moves. Even better, sign up for classes at the Tempest Freerunning Academy and learn how to be your own Peter Parker! So why did I post this awesome video on my blog? Can I hurl my body off a suspended pipe and pull myself over a 15 foot wall? Not on my life! But I can paint 8-bit bricks like nobody's business! Many of Team Tempest are also stuntmen, and I've worked with them on various projects. They came up with the idea of painting their 7,000 square feet of freerunning course to look like different environments, so they called me in to do the job. 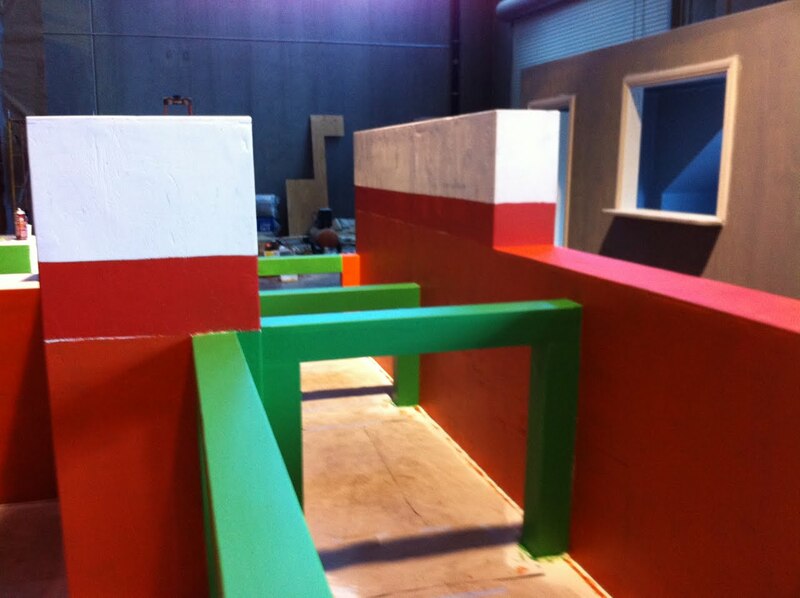 Photo 1: The "beginner's course" has a series of low level walls and hurdles, and its the first thing you see when entering the facility. The team wanted something that would really pop, and also appeal to the younger audience of future freerunners they are targeting to train. 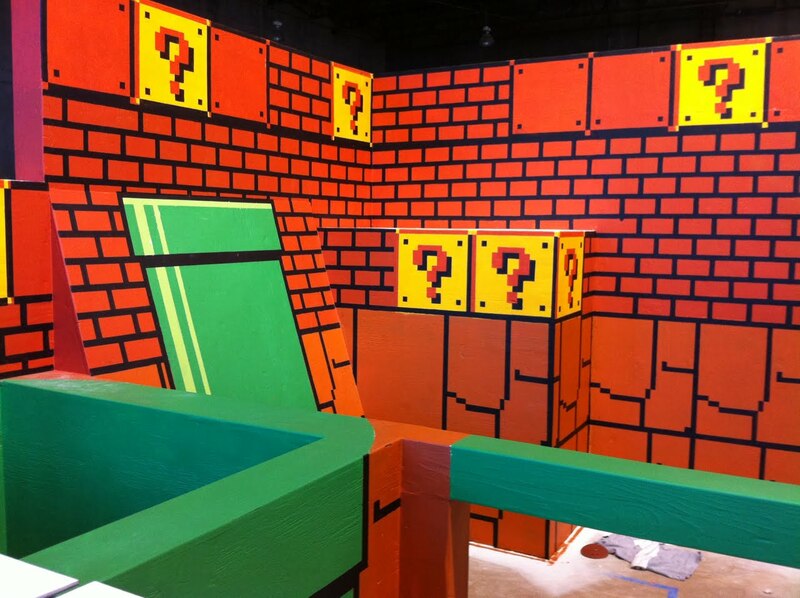 So they came up with the concept of painting it like Mario's world. We started with this image. A more fitting scheme if ever I saw one. Photo 2: At the back of the gym, they wanted something urban and contrasty to the bright, cartoon like Super Mario course. 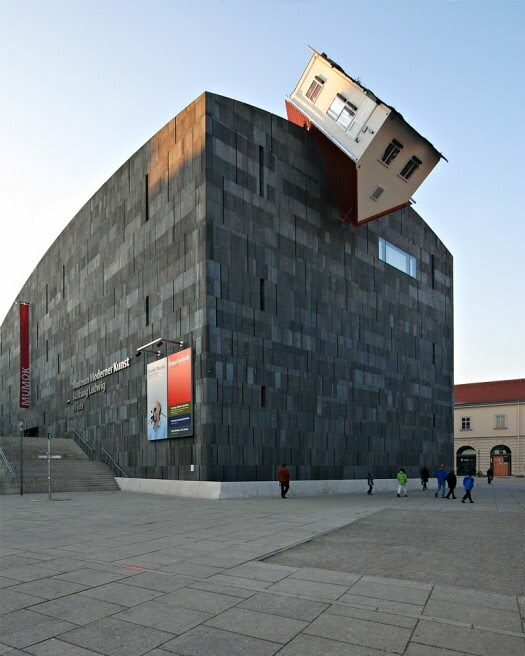 One of their reference images was this building designed by David Bell. It is both clean and gritty at the same time. Greyscale and colorful combined. So we based the back tower on this. 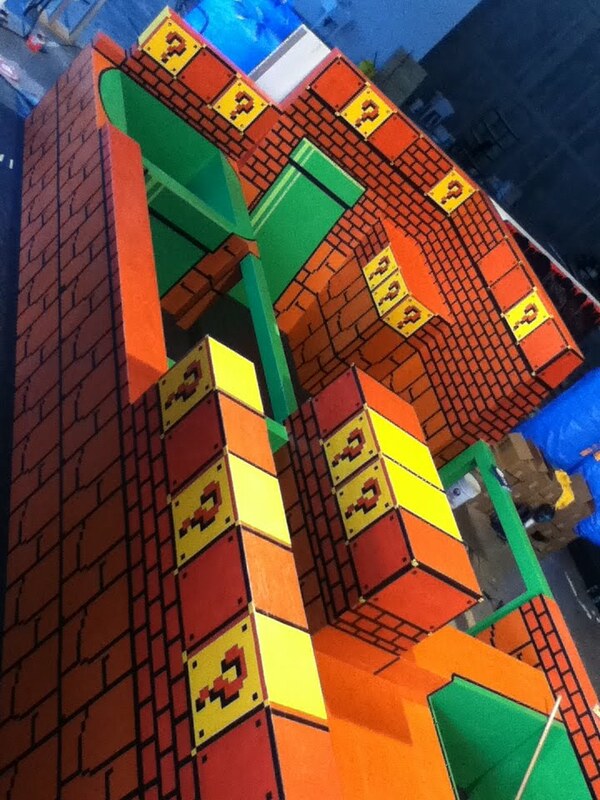 Photo 3: The entire course was designed by famed X-gamer Nate Wessel. It was constructed out of solid woods, and I found it like this, raw white primer. Photo 4: Being that each section WAS an obstacle course, there were no wide open walls. Every few feet, there was a step, a ramp, a tower, or a pit. 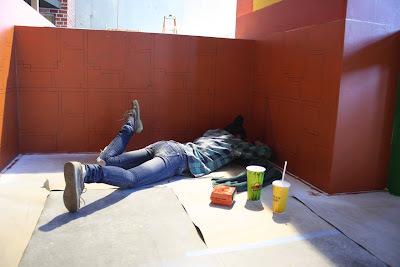 Every wall had 4 surfaces, so there was a lot of painting to be done. 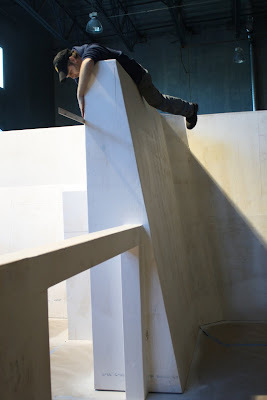 Photo 5: I had to attempt a little freerunning myself, as the small spaces, multiple tiers, and sloped walls made it hard to get stepladders or apple-boxes anywhere that they could be effective. 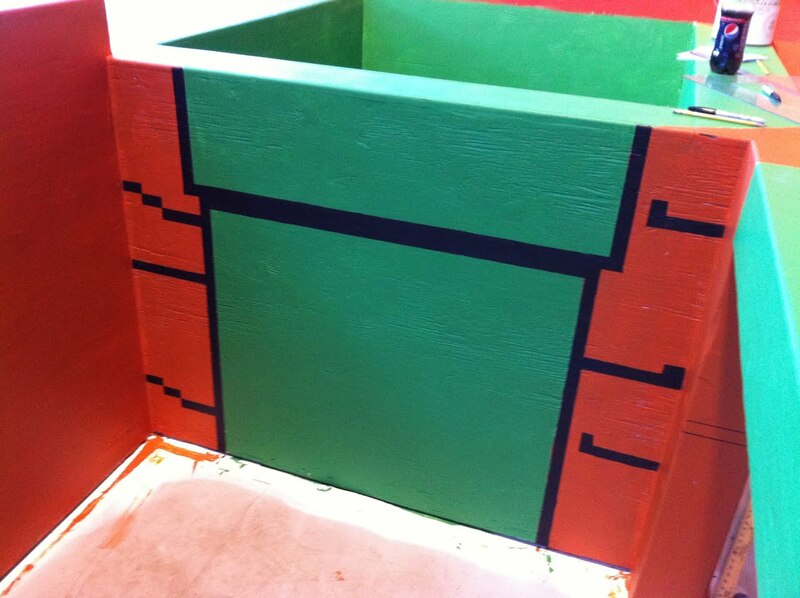 Photo 6: The first step was to mark off all of the basic color levels. The idea was that everything you could touch would be a solid object, so there was not going to be any sky painted, or murals of floating coins. I was basically laying out the entire course as ground, brick, pipe, and question mark boxes. It was harder to do than I though, since all of the construction was done to purposely not have any two surfaces on the same plain. It made it very difficult to execute a clean 8-bit look, as all of those lines should stay level at exact increments. Even harder was reaching all the places those lines had to go! 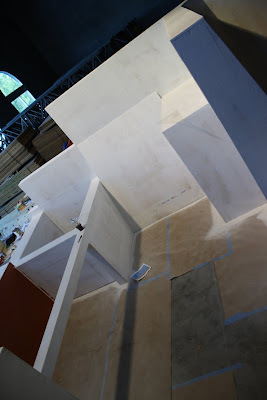 Photo 7: The next step was to put all the base colors on. 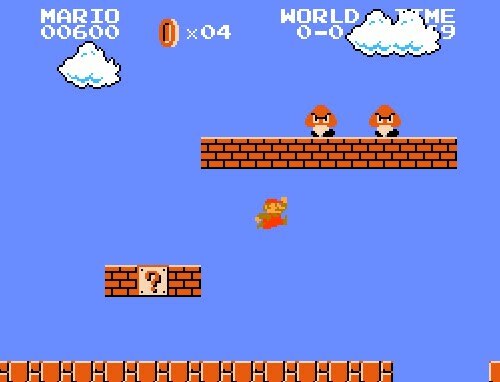 This actually took a few days in Mario land. I wanted the colors to be solid and even, so it took multiple coats. And since it was all dark colors, we had to be very careful not to overlap designated areas, or the next color applied would take even more coats. Photo 8: I used high grade exterior deep base paint so the color would hold, and it would last against a thousand pairs of rubber soles clamoring over it. My original plan was to tape everything off, but it turns out that a key component to the construction was to use a rough surfaced wood to allow for more grip. Inevitably, paint would leak into the rough grain and I would end up with a messier line than I would free handing it, so I went with the latter. 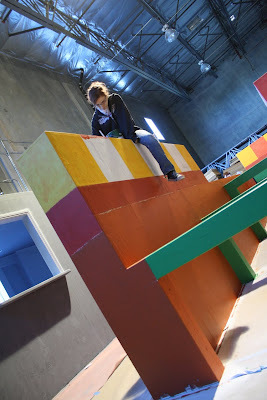 Photo 9: The trick with painting a freerunning course is that these guys climb EVERYWHERE, so every surface will be seen. For us that meant climbing over and under every part of the gym to make sure the paint scheme followed through. Here, Red 5 bases out the tops of coin boxes. 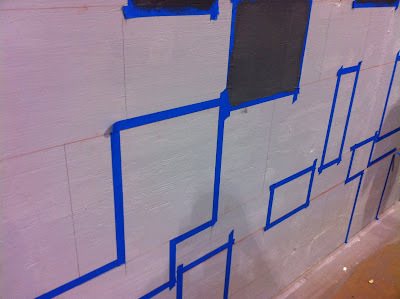 Photo 10: I made a few foamcore templates to help speed up the line work after all the colors were based out. I did a light pencil tracing, then Marissa followed through with a ruler, triangle, and sharpie. She made sure everything was straight, and the final black sharpie line made painting all the black more "coloring book" for me. I do a lot of painting, but rarely so much detail on a standing structure. I was amazed at how much time we spent either flat on the floor, or hanging way up high on this project! Photo 11: And the painting of black lines commences! You can see from this photo how much they pull everything together, though. 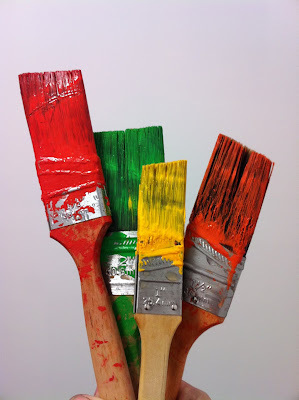 Photo 13: I took this photo with my phone right before cleaning the brushes. It has no rhyme or reason for being in this blog, I just thought it was a cool photo from the project! 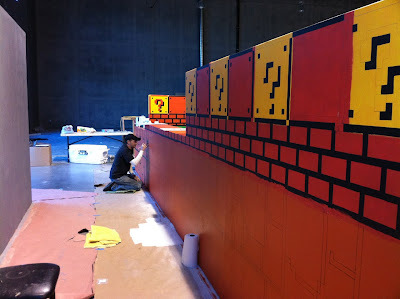 Photo 14: I added a few highlights to the pipes, and Mario land was finished. Team Tempest was excited to get it done. 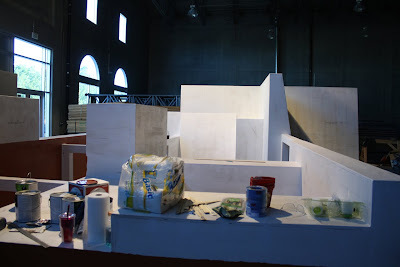 So much so, that as I was putting on the final touches, people were flying over my head, jumping from wall to wall! 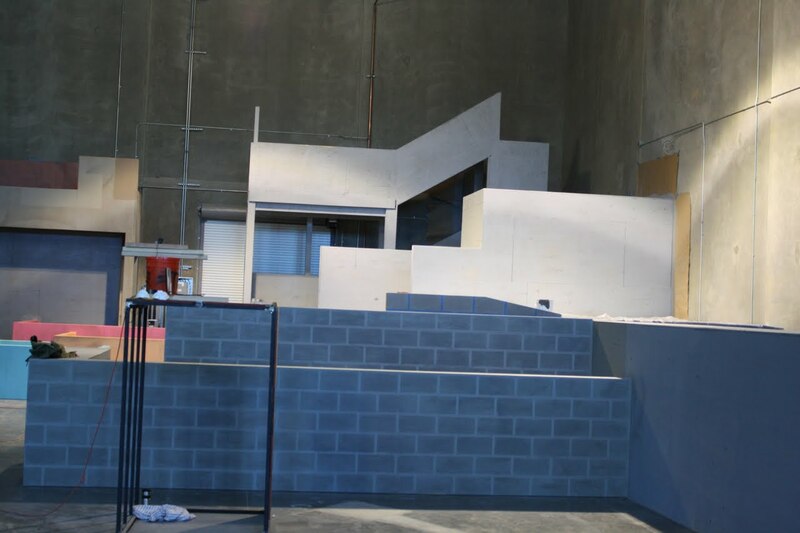 Photo 15: Here's a bird's eye view of the first course at the Tempest Freerunning Academy. Photo 16: So, then it was on to the back tower. This section, too, had multiple tiers, and a sheer drop that landed in a foam pit. Photo 17: The first step here was also to mark off the color levels, but unlike Mario Land, the math didn't need to be so specific. I chose the layered heights at random, varying from thick to thin and back again. 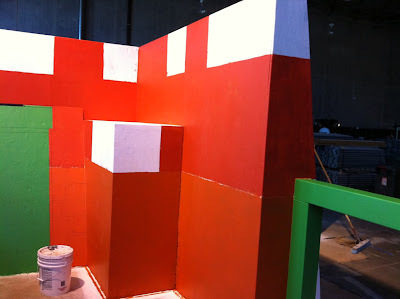 Despite the fact that these walls also had rough wood, I was able to tape off the colored squares because the more organic nature of the final look allowed for some bleeding between colors. This made painting this section much faster! 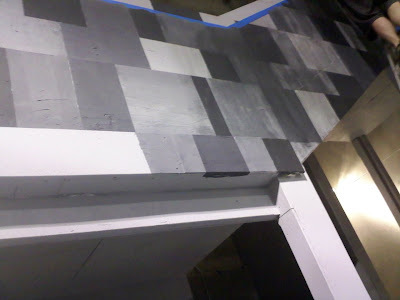 Photo 18: After all the squares were painted in a random patchwork of gray scale, a thin black wash was painted over everything, then wiped down to tie it all together. The very top 6 inches were painted bright red, both to add color and to serve as a warning that that level of the gym was off limits! Photo 19: The finished back course. This is the highest structure at the academy. It houses steep ramps and a vertical tunnel filled with wide spread hand grips. 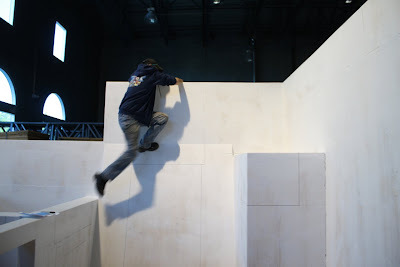 So, I may never be able to do any of the amazing things that Spiderman can do, but hopefully my artistic contribution to the Tempest Freerunning Academy will inspire you to train with them and give the web-crawler a run for his money yourself!